首页 › 新闻与文章 › 赛鸽与鸽舍 › The more you select the more you win! The more you select the more you win! During the long winter nights many fanciers take the time to think about the best possible couplings, the best birds in the loft and the best selection method. You should find the right answer to safeguard the future of your breeding loft and to have a successful racing season, which will be coming sooner than you think. 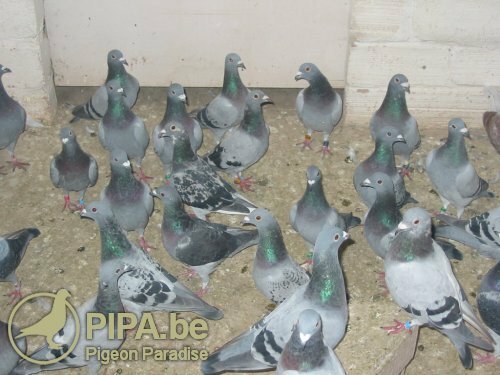 A good selection should allow you to compose a team that consists of the best possible racing pigeons in your loft. But in order to do this you should first of all decide what kind of team you are looking for. This means you have to determine what type of races you will be doing during the season and look for the pigeons that are best suited for this and that will yield the best results. If you manage to select the pigeons that are best suited for the competitions of your choice you might have a successful season ahead. When you have selected a racing team for next season you will also have to pay attention to the age of your pigeons. If you want to aim for the long distance races for instance you should look for a large team of older birds. This is because the physical strength of the bird is not all that matters in a long distance race. An equally important aspect is is their degree of experience and their resistance, which often compensates for the lack in dynamism, which is typical of an old bird. This also explains why a long distance fancier should have a lot of birds in his loft that can last for quite some time, especially if he wants to win top prizes regularly. His pigeons should not be past their best as soon as they have done some more demanding races. They should gain experience in these races and they should be able to do well in any weather condition. Obviously this does not apply to sprint racers. Thanks to weather forecast services, the internet and other innovations most sprint races take place in good weather. This means experience is not that important to a sprint race pigeon. A strong spirit and quick navigational abilities are the most important skills for a sprint racer. Young birds usually have a strong spirit: a young bird is driven by dynamism and is likely to be more motivated compared to the older pigeons. We should not forget that the same applies when you prepare your pigeons for next season. We have already discussed this in our article about widowhood. The point is that a difficult flight has a considerable impact on the nervous system of a young bird, whereas a dyed-in-the-wool old bird with plenty of experience is not likely to be disturbed by a flight in difficult conditions. The navigational system of a pigeon is an innate ability, which the fancier can improve with training flights. If a sprint racer has well developed navigational abilities his experience from previous flights will only play a minor role here. As we said earlier a fancier who will only play sprint races should make sure he has a racing team that consists of mostly young birds. We think fanciers should not focus on the number of prizes they can win but on the value of the prizes they win. A fancier has nothing to lose when he replaces an old, tired pigeon that can only win a few low prizes by a young and motivated bird with a promising future ahead. This means that a fancier who wants to do shorter distance races should have high quality breeders so he can always have new young birds to replace the older ones. But there is one exception: you should not replace older birds if their performance does not decrease over the years and if they are still fit. Besides you should keep in mind that older birds that are still fit and vital are not only great racers; they are also invaluable in the breeding loft. It would be wise to no longer let them do races as soon as they show signs of weakness. The same applies to long distance pigeons. An excellent sprint race fancier told us this: every time he enters the loft he would take the time to take a careful look at the behaviour of his pigeons in the loft. Some of them would get up a 1.50 metre high box with six or seven wing strokes, other much more nervous birds only need three to four strokes. He knows from experience that the best birds will be the ones that only need three to four strokes. Any fancier can learn important things from observing his pigeons in the loft. Those who have a thorough knowledge of the pigeon can judge its physical features fairly easily. Think of the bird’s balance, its skeleton, its muscles, the wings, its feathers and its vitality. Unfortunately some other features cannot be seen with a naked eye, which makes it much more difficult to judge them. The inner organs of a pigeon include its heart, lungs, liver, glands, and intestines and have a considerable influence on the performance of a pigeon as well. It is very difficult to judge the quality of the inner organs from the outside. So it is impossible to find out if the organs of a pigeon are functioning correctly. But there is something else we should take into consideration: the physical strength of a pigeon influences its performance as well. Even when a pigeon has a perfect build and a perfect health it is still uncertain whether it will be a successful one. When it has everything it takes to become a successful racer but it lacks a strong spirit and navigational abilities the pigeon will never become successful. The ultimate aim is to combine the two elements in your bloodlines: physical strength and psychic qualities; intelligence. A fancier will never become successful in sprint races if he neglects the physical characteristics of his birds. On the other hand a long distance fancier who neglects the intelligence and the psychic qualities of his pigeons will never become successful either. If you want your pigeons to improve you have to pay attention to both strength and intelligence. First of all you have to judge your pigeon in the hand: you should try to get a clear idea of its physical strength and the bird’s overall fitness. At the same time you should also make sure that the pigeons of your bloodlines have a high degree of intelligence, a lot of determination and good navigational abilities. If you can manage to select your birds with that in mind and if you can breed strong and intelligent birds season after season you will end up with a high percentage of top class birds in your loft. Your racing team will only consist of birds that are strong and intelligent enough to do the most demanding races.